'Crazy Rich Asians' Star Awkwafina Has Always 'Aggressively Been Myself' Rapper and actress Awkwafina has had a busy year. She's in two summer blockbusters: Ocean's 8 and Crazy Rich Asians -- which she says she knew would be a hit the moment she heard about it. 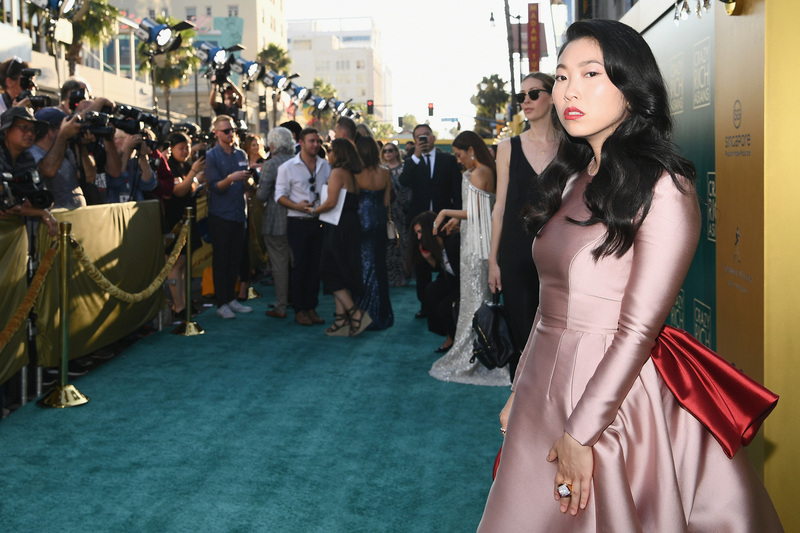 Awkwafina arrives at the Crazy Rich Asians premiere in Hollywood. The breakout star of Crazy Rich Asians goes by one name: Awkwafina. Clever and profane, the 5-foot-1 rapper-actress catapulted to Internet fame in 2012 when she released a music video that we can't really name on this site. Awkwafina is unapologetic about being profane, a rapper, and an Asian-American woman, though she felt differently when she first started as a performer. "Nobody wants to be 'the Asian,' " she says. "They want to be 'the artist.' And at first, I really didn't want the burden of representing [the Asian-American community]." But, she says, she quickly realized that everything she does represents her community, despite what she might want. Now, with roles in two high-profile summer blockbusters — Ocean's 8 and Crazy Rich Asians — Awkwafina says she recognizes she has a responsibility to the Asian-American community to make the right decisions about the roles she takes. I think that by being yourself, you don't dictate what an Asian-American is in 2018. You just add to what we are as a diverse people. "The only thing I can do, at this point, is to represent them well and ... not do anything to mock them that isn't good for the progress of how we're seen." And she thinks everyone should know better than to assume she represents all Asians. "I'm definitely not all Asians," she says, "but the thing that I've always done is aggressively been myself. And I think that by being yourself, you don't dictate what an Asian-American is in 2018. You just add to what we are as a diverse people." So Awkwafina's honored to be part of the cultural moment that Crazy Rich Asians is having — a film that features an all-Asian cast. The outpouring of support, praise and emotion toward the movie so far has been incredible for her. "People walk out of the theater, and their eyes are swollen from crying," she says. "For some people, it resonates so deep, and for me at least, it's the power of representation." That power of representation was what made her pay attention to the project in the first place. "I knew, from the second [I heard] that this movie was being made. It was raw excitement," she says. "It wasn't just 'Oh, my God, I gotta get in it.' It was just 'Wow, that's so cool' and something that I would see." She did get in the movie, as Peik Lin Goh, the Singaporean best friend of main character Rachel Chu. Peik Lin acts as Rachel's confidante, guide and stylist, urging her not to wear red to meet boyfriend Nick Young's upper-crust family. "She's a best friend that I wish I had," Awkwafina says. "She's honest, she's real, she has humility even though she does have money." For those who have read the book on which the movie is based, Awkwafina's interpretation of her character — originally written as a Singaporean socialite — might come as a surprise. It was a bit of a surprise for her, too. "I had to watch the movie to really understand what I had done with Peik Lin," she says. "It didn't make sense to me, I just hit the ground running when we were filming." Director Jon M. Chu doesn't believe it. "In my opinion, she fully knew what she was doing," he says, laughing. "She didn't just break the mold of Peik Lin, she shatters it, throws Champagne all over it and glitter, and in her heels, steps all over it!" Chu says their version of the character shifted to suit the actress. "In the book, it's a completely different character ... but when you have Awkwafina, you gotta let her stretch. You gotta let her be who she is." I would not be able to perform onstage without Awkwafina, Nora could not perform ... All the neuroses, all the self-consciousness that comes with adulthood, Awkwafina doesn't have that. Before she was Awkwafina, she was Nora Lum, a Chinese-Korean-American born and raised in Queens. There isn't a special story to her moniker — it was a joke among teenage friends. She says that when she released her first YouTube video as a young adult, "it seemed disingenuous to pick a random name to put the video under, so I stuck with what I felt was right. Then people started calling me that in real life. That was a mistake," she slaughs, "but at least it's memorable." Lum does make a distinction between herself and her onstage persona. Awkwafina, she says, is like "this wild id that has boundless confidence," able to say exactly what she thinks. Awkwafina gives her the confidence to explore what she wants to say, how she wants to say it. "I would not be able to perform onstage without Awkwafina; Nora could not perform," she says. "All the neuroses, all the self-consciousness that comes with adulthood, Awkwafina doesn't have that." Awkwafina is what allows her to rap about whatever she wants — growing up in Queens, being Asian-American, soda taxes — with a lot of words that aren't exactly FCC-friendly. "I made an agreement with myself when I first started that I will never try to push my music to a mainstream audience, because I enjoy having a small group of people that totally get it." She laughs at the idea of playing her music on public radio. When her first music video went viral, Lum was fired from her then-job as a publicity assistant. And she says, when her family heard about the video, "I'd always been a clown of my family so in that way, they really were not surprised. My grandma was always on board. She indulged my spunkyness and what I consider weirdness, she always knew to be something that would make sense in a song like that." Her dad, on the other hand, took a little while to come around. "My dad had never been the quintissential Asian dad," she says, until the video came out, "and that's when, all of a sudden, he was like," she deepens her voice, "you should go and become a — a sonogram technician!" She laughs. "It's like, 'Why now? Why didn't you push me through med school when I was in college? What's wrong with you?" But she knew, even at the time, that her dad was just worried about her. "I always knew deep down that he wanted what was best for me. He didn't want me in some credit hole chasing dreams that wouldn't exist," she says. "That's why it was important to me not to argue with it, and just show him that I believed it would work." Once her father saw that it did work, he went all in for it — though not so in for it that he would fly all the way to California for the Crazy Rich Asians Hollywood premiere. "They refused to come out to the premiere and I was like 'Oh, well, OK. Thank you." She laughs, "It's such an 'Asian thing,' but you know, they play it cool. They're not freaking out about it." But she FaceTimes with her grandmother every day, and her grandmother is one of Awkwafina's biggest fans. With acting, there will be a bigger market for us, for Asian-Americans as the years progress. And the roles will not have to depend on [our] Asianness. The industry is opening up, and I think that can only mean a great future. "She only looks at Awkwafina videos [on YouTube]," Lum says. "And there's an algorithm that when you look up certain things, it's going to suggest similar things, so she called me and she said, 'Nora, you're the only thing on YouTube. You're all over Youtube." She says she thought about trying to explain YouTube's algorithms but decided it wasn't worth it. "So she thinks I'm the president of YouTube, and I'm the only thing on there. It's cute, and I'll let her dream." In the meantime, Lum's keeping busy. Earlier this year, she released a new album called In Fina We Trust. She's already finished filming future projects, and she's hopeful about this moment. "With acting, there will be a bigger market for us, for Asian-Americans as the years progress. And the roles will not have to depend on [our] Asianness. The industry is opening up, and I think that can only mean a great future." Her future looks bright, but she says she's not sure what it holds for her. "Awkwafina never had a plan," she says. "There was never a roadmap, it just was what it was. It scares me to death sometimes." Meanwhile, it's been reported that Crazy Rich Asians will be getting a sequel, so audiences can look forward to seeing more of Awkwafina's Peik Lin. This story was edited for radio by Nina Gregory, produced by Hanna Bolanos and adapted for the Web by Petra Mayer.